We've decked out our best selling bouquet for the holidays! 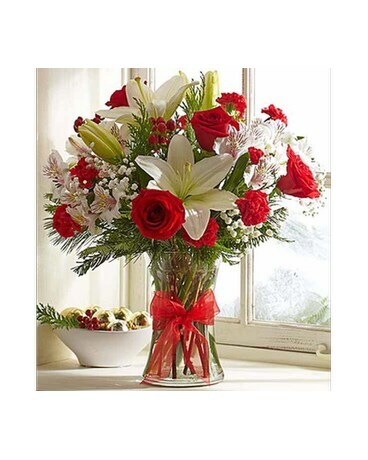 Inspired by the beautiful flowers you’d find at a bustling European flower market this time of year, this classic, crisp arrangement is hand-designed in a glass vase by our expert designers using the freshest red roses, white lilies, mini carnations and fragrant assorted greens. Wrapped up with a joyful red ribbon, it’s a gift that delivers your warmest wishes for a season filled with smiles.